The wolf was regarded by native Indian cultures as having very special spirit powers, particularly for hunting. 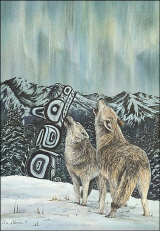 Kwakuitl mythology ranks the wolf as first among all the animals. 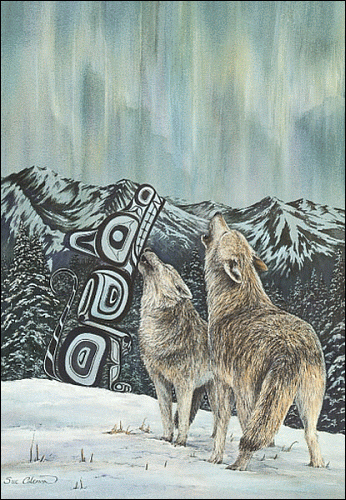 A Gitksan myth tells of a wolf that appeared in a village one day with a bone stuck in it's throat. The villagers removed the bone and the wolf left but never forgot their kindness. When a large snowfall brought famine to the village, the wolf returned and led the people to several caribou which it had killed for them.